LiveView GPS helps you gain access to a wealth of information with state-of-the-art personal GPS tracking systems including GPS tracking for cars, GPS data logging devices and more hi-tech products that help you rest easy. Your savings will be applied automatically at checkout on the Live View GPS website. 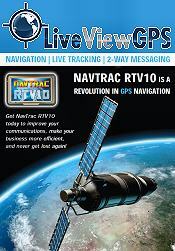 LiveView GPS tracking for cars and trucks - Sadly, a car alarm isn't always enough to protect your vehicle. With cars & trucks stolen at a rate of one every 26 seconds in the US, installing a GPS tracking system can sometimes be a driver's only hope for seeing his or her car again. LiveView GPS brings drivers peace of mind with sophisticated GPS tracking for cars and trucks that are covertly installed, so the criminal won't even realize it's there. With high performance GPS tracking and Auto Recovery Systems from LiveView, you can rest assured that you'll be back in the driver's seat in no time. Personal GPS tracking - LiveView GPS features GPS tracking for cars as well as personal GPS tracking devices that help locate missing persons. Discover products that deliver the information you need on the whereabouts of anyone or anything, in real-time, 24 hours a day and 7 days a week. Invest in easy-to-use personal GPS tracking systems that are portable and extremely compact (some no larger than a pager) to assist you in keeping track of your little ones, teenagers and elderly relatives, while also ensuring your own personal safety in case of an emergency. SPOT Satellite GPS Tracker - LiveView GPS tracking systems are simple to use and require no special software to download. Whether you're using GPS tracking for cars or for personal safety, all LiveView products feature maximum reliability. Just take a look at SPOT - The World's First Satellite Messenger. Thanks to SPOT's supreme satellite technology, the device works virtually anywhere (even where cell phones don't) so you always have a vital line of communication between you, your loved ones and the proper authorities. LiveView GPS has a mission - to provide you with commercial grade, cutting edge GPS tracking products and solutions that will keep you, your property and your family members safe. From GPS tracking for cars and trucks to personal GPS tracking devices, LiveView keeps you informed, arming you with the invaluable power of knowledge.